If you’re like me, you can’t stand having to switch keyboard modes just to hit an exclamation mark or comma in the middle of a body of text. The thing is, this is Gboard’s default setting. Fortunately, there’s a really simple way to fix it. You’ll need to jump into Gboard’s settings menu—there are a couple of ways to do this. 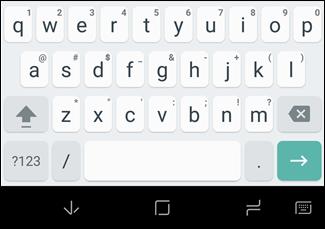 Alternatively, open the app drawer and find the Gboard entry (if you can’t find it, it’s because it hasn’t been enabled). Either way is two means to the same end, so it doesn’t really matter which way you go about it. In Gboard’s menu, select Preferences. So you can simply long-press a button to use its symbol, which honestly just makes life a lot easier.